It's been eight years since psychologist Deborah C. Beidel first met Sarah, but it's hard for even a seasoned clinician to forget this particular 12-year-old. When Sarah arrived for treatment at the Medical University of South Carolina in Charleston, she was an 8th grader who refused to make eye contact with other students at school. She identified her classmates not by their faces, Beidel says, but by matching their voices with their shoes. The girl also wore a winter parka zipped up to her chin, all day, year-round—in the South. "She said she wanted to disappear, to blend in at school, and no one ever remembered this girl was in their class," recalls Beidel, now a professor of psychology at the University of Maryland College Park and a co-director of the Maryland Center for Anxiety Disorders. "Children would come up to her and ask if she was antisocial, and she cried. They'd ask her, `Why are you wearing that coat?' and `What's wrong with you?' and she cried." This was not a case of simple shyness, Beidel says. Sarah suffered from social phobia, one of 50 such children in the mid-1990s who took part in the first significant study of preadolescent children with the psychiatric disorder. That research, conducted by Beidel and fellow University of Maryland psychologist Samuel M. Turner, paints a portrait of a lonely child who has few if any friends, avoids extracurricular activities, experiences near-constant emotional stress, and frequently suffers from stomachaches and headaches. In many ways, Sarah was one of the lucky ones. Her behavior concerned her teachers enough that the school urged her mother to seek professional help for the girl. More often, educators view socially phobic children as their good students rather than youngsters in need of therapy. Experts estimate that as many as 5 percent of children and adolescents are afflicted with social phobia, with 14 as the average age of onset. Yet youngsters with the disorder often slip through the cracks at school, where their problems are either dismissed as "a phase" or overshadowed by the disruptive behavior of children with conditions like attention deficit hyperactivity disorder. "These are the quiet children in class," says Patricia Marten DiBartolo, a psychology professor at Smith College in Northhampton, Mass., who specializes in anxiety disorders. 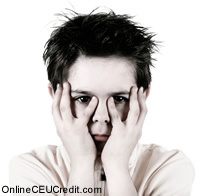 "Kids with social phobia often don't get noticed as much. In fact, that's their end goal." Social anxiety disorder didn't become a formal psychiatric diagnosis in the United States until 1980, when it was listed in theDiagnostic and Statistical Manual of Mental Disorders, the bible of the mental-health professions. Several more years elapsed before the condition was recognized in children. Referred to even today as the "neglected anxiety disorder," the symptoms of this little-known phobia can be debilitating if left untreated: Studies suggest that the condition persists into adulthood and may lead to suicide attempts, alcohol abuse, inability to work or attain a higher education, depression, and social isolation. The exact cause of social phobia remains a mystery. But the fact that it often develops in early adolescence or childhood and typically afflicts more than one member of a family leads many researchers to believe its origins are biological. That means a child might already have a tendency toward social phobia, but the symptoms of the condition don't become obvious until they are triggered by a socially traumatic event—like being laughed at for hitting a sour note during a concert solo in front of a live audience. "From the very beginning, these children are more anxious—around people, in new situations, with new toys," Beidel says. "We think this emotional type is the earth in which social anxiety grows." One obstacle to early diagnosis and treatment of social phobia is a widespread perception that its symptoms signal nothing more serious than shyness. The key difference, psychologist Christopher Kearney says, is that shyness doesn't interfere with a young person's ability to carry out a normal life. Kearney runs the University of Nevada Child Anxiety Disorders and School Refusal Clinic in Las Vegas, where he treats children ages 5 to 15 with a range of anxiety-related problems, including intense fear of school and refusal to speak. He sees about 30 children a year for social phobia, but believes that many more go untreated. "People are usually amazed that there's a clinic for this kind of problem," he says, "but what we're finding is it's a very serious condition." Shy people, Kearney says, might hang back from the crowd in social situations, or hesitate about attending a party, or appear nervous when they perform in front of others or engage in conversation. "Shyness is a common personality characteristic that most people see as socially acceptable, and shy people are not so overanxious that they avoid social situations altogether," he explains. "Somebody with social anxiety disorder would do almost anything to avoid all kinds of social situations, and their condition keeps them from doing things that they normally would like to do." A case of shyness is almost certain to be social anxiety disorder when the fear of interaction is so intense that it triggers stomachaches, headaches, shaking, stammering, crying, or—in severe cases—mutism, Kearney says. Social phobics are typically terrified of public speaking, or any situation that requires them to perform in front of others. Some can't eat with peers, meet new people, talk with people in positions of authority, or use public restrooms. Unfortunately for children with social phobia, those activities are the sum of a typical day at school. "The school day for kids with this disorder is so stressful, it's a nightmare," says Carrie Masia-Warner, an assistant professor of psychiatry at New York University's Child Study Center whose research focuses on school-based interventions for children with social phobia. "School is made up of so many of the things they fear most—being called on in class, reading aloud in front of people, walking into class late, eating with other children, walking through the halls with other students." Social phobia doesn't have to be a lifelong condition, though. For adolescents as well as adults, a combination of cognitive and behavioral therapy has shown promising results. Researchers have found that, in those age groups, the condition is often accompanied by distorted perceptions that can be paralyzing. Sufferers of social anxiety "have such negative thinking," Masia-Warner says. "They predict the worst will happen in a social situation. They think, `If I speak up in class, I will get the wrong answer for sure, and everybody will laugh at me and I won't be able to show my face in the classroom again.'" Cognitive therapy attempts to reshape the self-defeating thought patterns of those who suffer from social anxiety. Behavioral therapy teaches patients coping techniques and social skills and gives them opportunities to practice what they've learned in social settings. The effectiveness of forms of treatment for social phobia in adolescents was tested in a 1995 study led by Anne Marie Albano, now a clinical psychologist at the New York University School of Medicine's Institute for the Study of Anxiety and Mood Disorders. Five teenagers with social phobia were treated in a 16-session group program, with parents involved in some sessions. The researchers focused on skills training—social skills, problem-solving, and assertiveness—cognitive restructuring, behavioral exposure, and homework. Over a one-year period, the adolescents showed significant improvement: Diagnostic interviews after one year showed full remission of social phobia in four of the teenagers, and partial remission in the fifth. For the youngest sufferers of social phobia, however, behavioral rather than cognitive therapy appears to be the most effective course of treatment, according to the research of the University of Maryland's Beidel and Turner. "There's no evidence that [preadolescent] children with social phobia have the negative thoughts associated with the condition in adults," Beidel says, "so cognitive therapy with younger kids isn't going to be effective." Instead, in a 2000 study of 67 children ages 8 to 12 with social phobia, the psychologists found that teaching children social skills, giving them real-life opportunities to practice those skills, and then gradually exposing them to the social situations they most fear—"play dates," pizza parties, field trips—led to significant improvement. In fact, 67 percent of the preadolescents in the study who received that course of treatment, called "social effectiveness therapy for children," no longer met the diagnostic criteria for social phobia, compared with 5 percent in a control group. When the children reported for follow-up interviews six months later, Beidel and her colleagues found that the gains achieved through behavioral therapy had held. New York University's Masia-Warner has taken the behavioral therapy approach to the schoolhouse. She reasons that because the school day is so rife with terror for children with social phobia, it may be the best arena for diagnosing and treating the elusive condition. In a 2001 study, Masia-Warner found that six teenagers with social phobia in a middle-class New York high school on Long Island experienced significant to moderate improvement in their condition after a 14-session program of group treatment conducted at school. Researchers first educated teachers in the 1,300-student school about social phobia and then asked them to name students who appeared to match the description of the disorder. Parents of 11 of 46 students allowed their children to be screened, and three boys and three girls were found to actually have social phobia. Working in a school "allowed us to conduct realistic exposure exercises," the clinicians wrote in a February 2001 article in the Journal of the American Academy of Child and Adolescent Psychiatry. "For example, teachers were asked to assist with practice exercises, such as having participants read aloud in class, answer questions, and enter the classroom when other students were already seated," they wrote. "In addition, during some of the sessions, participants were sent on assignments to speak to secretaries in the main office, approach the principal in the hallway, and start conversations with their peers at a weekly bake sale. We also had the two groups attend a joint pizza party in the school recreation room." Masia-Warner is continuing her work now in Staten Island parochial schools with a grant from the National Institute of Mental Health, and plans next fall to explore the support-group-style treatment in schools. "I can't tell you how successful this has been," she says of the school-based interventions she has tested so far. But for parents of socially phobic children who don't have access to a behavioral therapist—or for children and adolescents who are diagnosed, sometimes mistakenly, with another condition like depression—medication is often the only viable solution. Most psychologists are reluctant even to discuss drug therapy for children with social anxiety, arguing that medications like the antidepressant Prozac are quick fixes that don't address the skills deficits and distorted perceptions inherent with the condition. Children, even more than adults, they say, can learn to conquer their fears. Medication, though, has been shown to help. Beidel and Turner, with funding from the National Institute of Mental Health and Eli Lilly and Co., the maker of Prozac, are now two years into the second phase of their research on social phobia. This time, they hope to compare the effectiveness of drug treatments for adolescents and children (namely Prozac) with behavioral therapy. "I became a psychologist because I first wanted to try to do treatments without medication," Beidel says. "But in many cases, I think medications are an important component of treatment. About 60 percent of the children with social phobia we studied have a second disorder, like depression, or specific phobias like needles. There's no reason for medications in the latter, but with depression, yes, perhaps [drugs] help. "A little bit of Prozac or Paxil," she says, "seems to decrease their anxiety just enough to then engage them in behavior therapy." That's precisely the course of treatment that worked for Sarah, the painfully shy 12-year-old Beidel studied in the 1990s. Now a confident young woman who is attending college on a scholarship, Sarah has appeared in several television shows about social phobia. "She's doing beautifully," Beidel says. "Last time I talked to her, she said she wanted to do some acting." "These are the quiet children in class. Kids with social phobia often don't get noticed as much. In fact, that's their end goal." In one study, teaching children social skills and gradually exposing them to the situations that they most fear, such as field trips, produced significant improvement. The preceding section contained information regarding social phobia in children. Write three case study examples regarding how you might use the content of this section in your practice. What role does Beidel say that antidepressants play in working with children with social phobia? Record the letter of the correct answer the CEU Answer Booklet.